12.9 GB download size Too large to download? Choose hard drive delivery at checkout. Recorded by the Spitfire team at a number of boutique London studios, including Spitfire HQ in King’s Cross, and our old favourite, the classic vintage studio Air Edel, in Marylebone. With a useful selection of classic, vintage, modern, broad and room microphones, our Producer Portfolio features the talents of legendary musicians, producers, composers and programmers. We’re very proud of what we've achieved at Air Studios with our existing orchestral and definitive ranges, but it’s not right for every application. With this new range, we have recorded in smaller spaces — close, mid range and room perspectives with carefully positioned ‘A class’ mics and pre-amps to give you the raw materials you need to make these sounds your own. Why be a jack of all trades when you can be a master of one? It is this sentiment that led us to search high and low for the most sensitive, beautiful, sonorous, and honest piano sound. Perfect for those delicate ballads (think "Mad World" by Gary Jules), or that intimate heart rending cue (think Newman's "American Beauty"). When carrying out sampling experiments some years ago, we discovered the very beautiful world of an upright piano with a middle "practice felt" or "celeste" pedal engaged. Whilst being hard to get a decent sound from, it produced the most beautifully gentle and touching sound. This became our widely loved "soft piano", available as part of our original LABS range. Our renewed quest to find the perfect "celeste" pedal piano ended at Peregrine's pianos on the Grays Inn Road in London. We then set about sampling in much more detail. 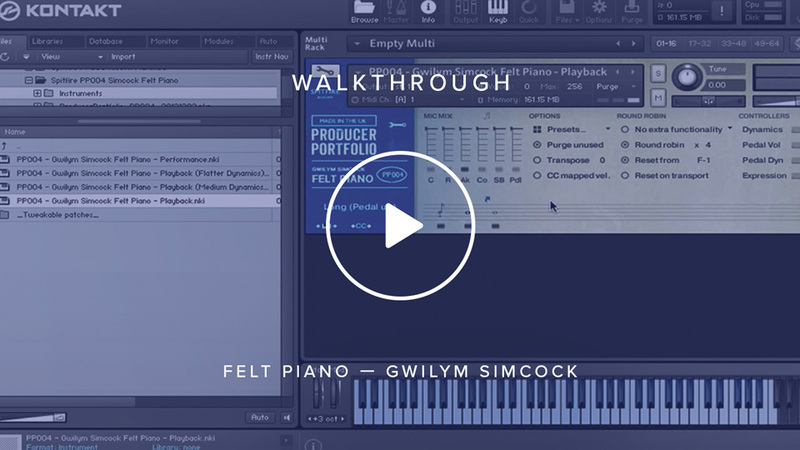 This piano was played by Mercury Award nominee Gwilym Simcock, and recorded with a number of microphones in different perspectives via Neve pre-amps and Cranesong AD converters at 96k. From the almost vintage sound of a mono soundboard mic, to a beautiful natural surround perspective of the room itself. Most celeste pedals allow for only one dynamic layer, but this piano is more responsive than others, so not only did we record several round robins, we recorded two dynamic layers, release triggers and round robin pedal damping and releasing. We also recorded the pedal noise separately, which you can adjust from the front panel.